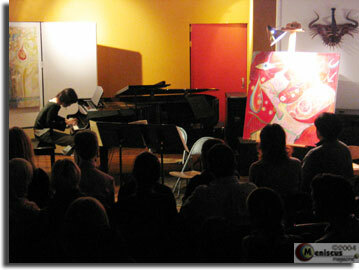 An evening of original music and intricately woven visual language. 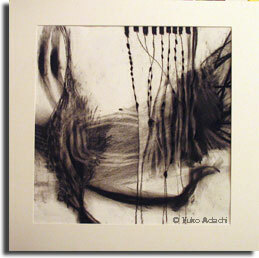 Through Adachi’s paintings a philosophy of unlimitations, metaphysical intrigue and growth is revealed. Their two most recent releases, All is One and Telluride is Acoustic, display two sides of the same avant-jazz coin that is JFJO. Join them on their “Magical Tour of Truth, Love, and Light”. David Murphy from STS9 talks with Meniscus about the sense of life that dawns inspiration for the river of music they produce. What does it take for a soul to create such a mellifluous groove? In a night of creative interpretation, fine artist Yuko Adachi and musicians Ai Isshiki and Sakiko Mori juxtaposed original and existing music against oil paint. At the cozy Zeitgeist Gallery in Cambridge, Mass., the artists used each other’s works as cross-inspiration in an aurally colorful blitz of the senses. 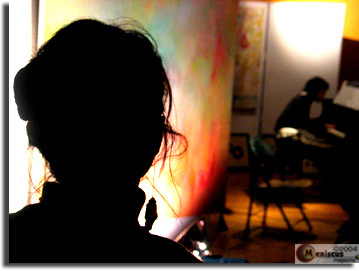 When the group decided to collaborate, Ai Isshiki, the composer of Echo gave Adachi the assignment of creating a piece of artwork by listening to her original composition. The result was a smaller charcoal drawing placed in the spotlight before the two featured composers seated at the grand piano. The instruction was to paint the piece in two minutes and to work in black and white—two rules that patient colorist Yuko Adachi is not used to. In order to literally draw the sounds, Adachi would come up with adjectives while she listened to the music, like creepy, eerie, mysterious, beautiful, serene and peaceful. What she found was that she couldn’t resist adding a little colored paint to the mix. That’s when she grabbed the charcoal. 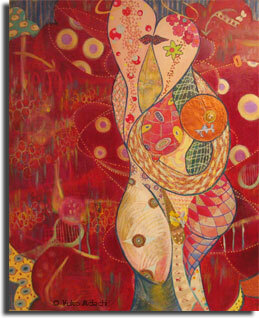 The next feature of the evening was a large canvas called Metaphysical Crush. 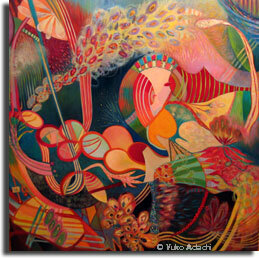 Mori chose the Stravinsky piece, Tango to verbalize the essence of this colorful representation of Adachi’s spirit. That was until she met this person. “I looked into his eyes,” pausing with great emphasis, “his eyes and my eyes just beamed to each other! I didn’t know this person but as we started to talk, we looked into each other and his eyes were like a galaxy! We felt the beam of each other’s souls and we couldn’t look away from each other. It was something that I’ve never had before.” He felt the same. Something made that moment so emotional, and although she didn’t know this person, she felt a strong affinity. But when two people connect, its good to be close. When they touched, the intrigue only intensified. Adachi calls this a Metaphysical Crush because her experience was not just typical sexual attraction. This meeting was actually a wake-up call from a spiritual world. Experience conveys spirituality so strongly—more than a book ever could. The next presentation was a piece composed by Ai Isshiki to match Adachi’s painting, Unlocking the Layers. 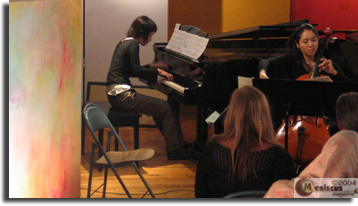 Played as a trio, Isshiki was joined by Jaehee Ju on cello and Ying Xue on violin. Gesturing towards the painting, Adachi explains that every relationship you have with someone transforms your life. When you live in this world, people expect you to behave in certain ways, since you are twenty something, upper class, lower class or whatever your situation may be. People put a certain stereotype onto you that sometimes you can’t live up to. Society tries to force you to do as you’re expected. “But I think its really unnatural trying to conform to something someone else has on you,” explains Adachi. As a result we put up invisible barriers to separate our true self from the real world. After years of this, it’s easy to forget who that true person is behind the mask. 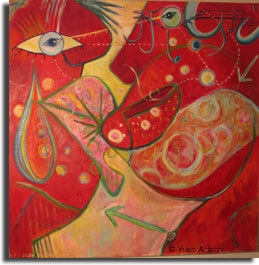 Pointing to the copper colored circle in the middle of the painting, she explains that this is her breast, her heart, made out of metal, representing the barriers. But also there’s a key with wings ready to open it up. Surrounding the couple is a beautiful field of energy. It’s about opening yourself up. Notice the spiral of energy going through the two; the arc of energy; the intertwining female and male organs; the whole arm that wraps around one body that becomes two bodies that becomes one. Looking at the two people kissing, the intertwining colors and Adachi’s explanation gave me goosebumps. If you just saw the energy of two loving beings, this is what you’d see. Moving on to the next presentation of the chilly New England evening, Adachi hoisted a colorful wooden panel entitled Gift of Growth into the limelight. 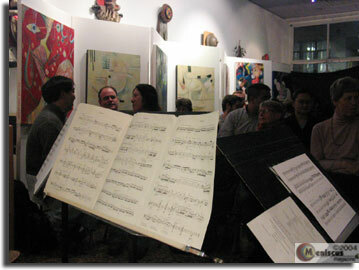 Led by pianist Sakiko Mori, the quartet accompanying this painting comprised of Shan Shan MA on clarinet, Yin Xue on violin and cellist Jaehee Ju. To express musically what Yuko has laid out in colors, the quartet choose the fourth and fifth movements of Mussiaen’s Quartet for the End of Time. “I really think the painting is a documentary of me as a person, to be shared with other people,” says Adachi. “It’s a visual diary.” When Yuko was 26 and graduating from school and going through many emotional struggles, she realized that when you’re so lost, you seek certainty. But you can always find assurance and stability if you know where to look. The final piece of the evening was an oil painting Adachi created to the music of George and Rosemary, an animated project Isshiki composed for a short animation film as a final project for her film scoring degree at Berklee. 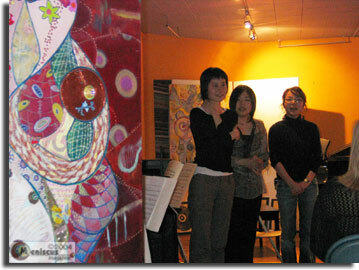 Yuko painted the original piece from listening to the music alone. The sound was in line with what contemporary composers are doing these days in contrast to true classical composers like Mozart and Bethoveen: using an abstract rhythm and employing silence to create impact. It caused the listener to go deep into a space where your body is here, but your mind goes somewhere else. This piece was performed by just a piano at the gallery but the music is scored for a full symphony—as Yuko listened to it to create her new masterpiece. What became of the exercise is a pure reaction to the music: “It was absolutely fun, beautiful, adventurous and innocent; it has all kinds of drama to it.” The melodies contain a magical glimmer of fairy tale fantasy, fraught with hope.